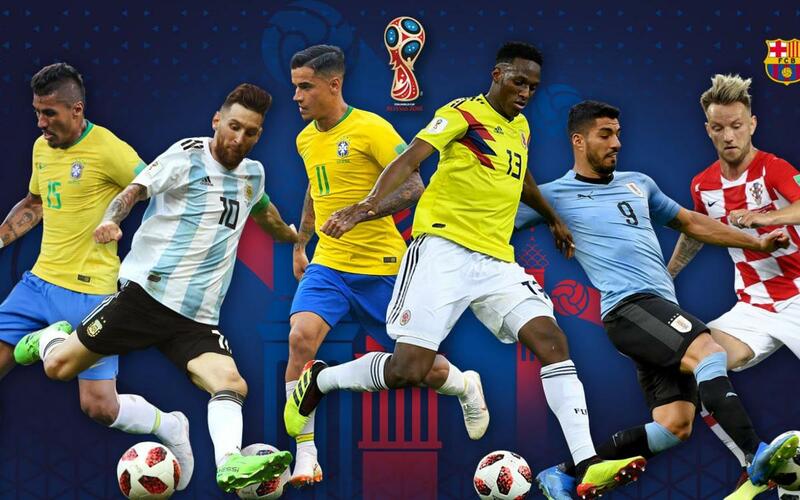 When Yerry Mina headed in a late injury time equaliser for Colombia against England, Barça reached double figures for goals scored at the 2018 World Cup. The 10 goals scored thus far have come from Mina (3) Philippe Coutinho (2), Luis Suárez (2), Leo Messi, Ivan Rakitic and Paulinho, equalling the tally from the 2014 competition (through Messi, Neymar and Alexis Sánchez) and 2010 (Villa, Iniesta, Puyol, Yaya Touré and Rafa Márquez). Our combined forces are still some way from topping the club's record number of goals, scored in 1994. Between them, Hristo Stoichkov, Romario, Andoni Goikoetxea, Txiki Begiristain and Pep Guardiola amassed 15 goals in the United States. But with seven Barça players still involved in the competition, there is every chance that the record could be broken this summer. The club are currently joint top of an intriguing battle to become the highest scoring team at the World Cup, level with Paris Saint Germain (Neymar, Di Maria, Thiago Silva, Mbappé and Cavani) and Tottenham (Kane, Vertonghen, Eriksen and Son Heung-Min). Real Madrid (Ronaldo, Modric, Kroos, Isco and Nacho) are close behind with 9 goals but are running out of goalscoring candidates, whilst Manchester United (Lukaku, Fellaini, Rojo, Pogba and Lingard) are also in contention with eight.